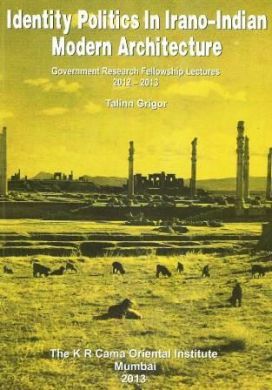 Identity Politics in Irano – Indian Modern Architecture By Talinn Grigor This book consists of a series of four Government Fellowship Lectures delivered by Talinn Grigor at the K R Cama Oriental Institute in February 2012. Chapter one – Neo Achaemenid Style from Parsi Bombay to Qajar Tehran. This chapter traces the two different types of neo-Achaemenid revival architecture in Parsi India and in Qajar Iran from the 1850s to the 1930s. When Maneckji Liji Hataria landed in Bushehr on the Persian Gulf, contact between the Parsi Zoroastrians of India and their co-religionists in Qajar Iran had been sporadic since the fall of the Sassannian Empire in 651. 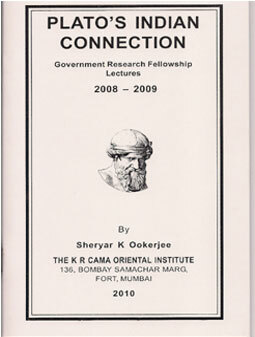 Hataria had been sent to Iran by a Bombay-based organisation, The Society and Fund for the Amelioration of the Conditions of Zoroastrians in Iran. Hataria’s forty yearlong effort was pivotal not only to the progress of his adopted community, but also to Iran’s reform programme in the late 19th and early 20th centuries. Architecture, a major sphere of Parsi patronage, was one of the most vivid aspects of this colonial encounter that linked the Parsis to their ancestral land until the late 1930s. Chapter two – Western Art Historiography in Iranian Architecture. This chapter focuses on art historical narratives that formulated a revivalist discourse which in turn affected the creation of a hybrid style of architecture in Qajar and Pahlavi Iran. Artistic appropriation of forms and icons as a mode of identity formation has been a deep-rooted tradition in the politics of Iranian kingship. Rulers from the antique, Islamic and modern periods were keen on borrowing artistic vocabulary from the past in order to convey an expressly Iranian cultural and political distinctiveness. By focusing on the period that stretches from the reign of Fath Ali Shah to the fall of the Qajar monarchy and formation of the Pahlavi dynasty, this chapter reveals a fundamental ideological change in the use of architecture as the signifier of royal legitimacy. Chapter three – Burying Ferdowsi in Reza Shah’s Iran Here the author examines the architectural history of the modern mausoleum of Ferdowsi, the renowned author of the Shahnameh. When Reza Shah’s government decided to celebrate the medieval poet’s millenary anniversary in 1934, the discovery of Ferdowsi’s grave gave rise to a new mausoleum in his hometown of Tus. 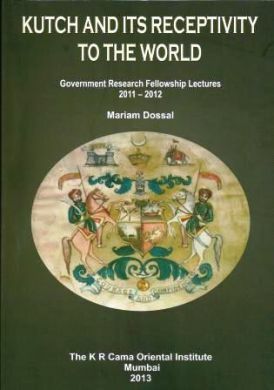 Its inauguration was tied to a major academic conference in Tehran and Tus that subsequently extended to Soviet Moscow, Nazi Berlin as well as Paris, London and New York. The paramount icon of revivalist and modernistic ideologies, Ferdowsi’s monument encapsulated the aspiration and vision of the early Pahlavi elite and served as a blueprint for subsequent public landmarks and ceremonies in modern Iran. Chapter four – Celebrating 2,500 years of Persian Empire in 1971 This chapter jumps to the end of the Pahlavi era and analyses the events of October 1971. The celebration of the 2,500th year anniversary of the legendary king, Cyrus the Great, validated the neo-Achaemenid architectural culture under the Qajars and the Pehlavis, but also gave the orientalist tendencies in politics and popular culture a new impetus. ————————————————————– Dr Talinn Grigor received her Doctorate from the Massachusetts Institute of Technology . She is currently an Associate Professor of modern and contemporary architecture at Brandeis University. Her research concentrates on the cross-pollination of architecture and (post) colonial politics, focused on India and Iran. Her first book, Building Iran: Modernism, Architecture and National Heritage under the Pahlavi Monarchs, 2009 examines the link between official architecture and heritage discourses in 20th century Iran. Dr Grigor has received several prestigious grants, including those from Cornell University, and the Getty Research Institute.